Massey Ferguson, a worldwide brand of AGCO (NYSE: AGCO), is proud to announce the release of its all-new, powerful and compact MF 6700 S Series. Straightforward Fuse Technologies including Auto-Guide 3000 guidance system with GO-Mode and AgCommand telemetry for full work monitoring. The MF 6700 S is powered by a new 4.9 litre, four-cylinder AGCO POWER engine, which delivers exceptional power and torque for high performance at lower engine speeds. The engine complies with the strict Stage IV (Tier 4 final) emission regulations using a maintenance free, Selective Catalytic Reduction (SCR) and a Diesel Oxidation Catalyst (DOC) system with an electronic waste-gated turbocharger. The straightforward and compact design houses the catalyzers in an oval-shaped exhaust, and the DOC under the bonnet. There is no need for an additional, large cooling package ensuring the MF 6700 S tractors continue to offer superb visibility to the front and sides. Running costs are further reduced by the 600hr service intervals - 20% longer than previous designs. For the first time, the continuously variable Dyna-VT is now available from the 130hp MF 6713 S model upwards. This delivers ultimate control and economy by providing precise regulation of forward speed, while minimizing the engine rpm ensuring the tractor always operates at optimum efficiency and economy. The latest Dyna-4 transmission now offers further efficiency providing 40 km/hr at engine speeds as low as 1,850rpm. Dyna-6 and Dyna-4 transmissions now provide an AutoDrive pedal mode. In the ‘Automatic’ setting this changes gears automatically, according to the engine load and speed. Built on a 2.67m wheelbase, the MF 6700 S tractors weigh 500kg less than equivalent six cylinder models. Coupled with powerful engines, this produces an unrivalled power to weight ratio that results in a light footprint and optimum economy. The MF 6718 S offers the tightest turns available from a 200hp agricultural tractor due to its compact design and sculpted front frame delivering a turning radius of just 4.75m, even when fitted with the Integrated Front Linkage System (IFLS). Massey Ferguson’s Speedsteer increases the steering ratio, minimizing the number of steering wheel turns needed to make a turn. This increases efficiency making headland turns faster and easier. Hydraulics on the MF 6700 S range are designed to handle the demands of modern implements with ease, as well as providing the flow and power for fast, efficient loader operations. Flowrates of up to 190 litres/min are available from the load-sensing system, which delivers the capacity to control even the most complex implements. Up to five rear hydraulic valves can be specified on all Dyna-VT models, and all rear couplers are equipped with decompression levers, which make it faster and easier to connect-up machines. A new rear power beyond installation is ideal for high-tech hydraulically driven implements equipped with independent flow control valves, such as potato planters and sugar beet harvesters. Rear linkage lift capacity is up to 9,600kg on Dyna-VT models which handles heavier, high capacity implements with Massey Ferguson’s renowned electronic linkage control (ELC) providing easy operation. The compact dimensions, power, visibility and high hydraulic capacity make the MF 6700 S the perfect loader tractor, with the addition of the Visioline roof option offering an unrivalled view when loading at height. Massey Ferguson’s 900 front loader can now be specified with a “live third” service. A clever addition to the loader is the hydraulic control that enables the operator to use the third service and crowd an implement at the same time. The MF 6700 S is now equipped with a new active mechanical cab suspension, with Continuous Damping Control (CDC) for the ultimate comfort, both in the field and on the road. This reduces heave/pitch and roll movements, reacting according to vehicle behavior to provide optimum comfort to match all terrains and conditions. 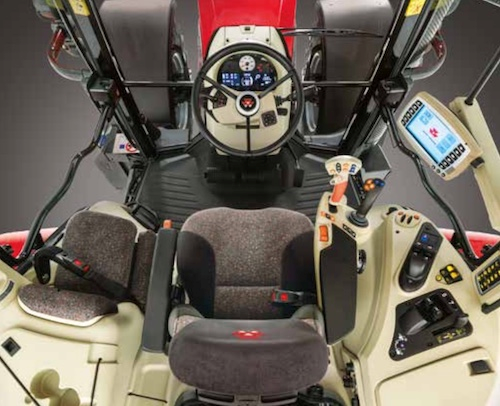 Inside, the cabs include the same clear, colour dashboard as the range-topping MF 8700 as well as the new Set Up and Information System (SIS), which offers a fast and easy way to set and monitor machine functions.